This three-bedroom apartment sleeps 8, including a double sofa bed, the large lounge area leads onto a spacious balcony that receives sun from morning until night. A good size kitchen is equipped with fridge/freezer, microwave, hob and oven, toaster and all requirements for 8 persons. A small utility area houses the washing machine. Bedroom 1 has an en-suite bathroom with shower over bath, there is also a separate shower room. In the lounge is a television with a radio and DVD player. Linen and towels are provided and a cot is available to hire. This complex is fully wheelchair friendly and has elevator access to secure underground parking, there are sloped walkways throughout should stairs need to be avoided. Golf and Bowls: Winter Garten is a bowling complex and our guests receive preferential rates and booking times at the on site bowling lawns. Golf is available at Golf Del Sur, a championship course, which is five minutes walk from Winter Gardens. Amarillo Golf is only another ten minutes away. Locally: Winter Gardens is approximately 10min walk from San Blas Square, which has of numerous shops, restaurants, Internet Cafe, supermarket, chemist, cafes and bars etc. There is free live entertainment outside in the square at night. Closer to the complex, in fact just outside the entrance, there is an excellent Chinese restaurant, an Irish bar and restaurant, together with a Tapas bar and an International restaurant. There is a night-club across the road at Santa Barbara Golf and Ocean Club, and another in San Blas Centre. A new marina is only 250 meters away. Situated at the nearby golf club are a putting green, driving range and mini golf. There is also a tennis court. Out and About: Los Abrigos, a local fishing village with probably the finest seafood restaurants in Tenerife, is only a five minute drive, or if you feel inclined, just a further five minutes walk across the pebble beach from San Blas. Should you require something livelier, then Los Cristianos and Playa de Las Americas are only 10 min drive away. The Golf Del Sur is ideal for couples and families who don’t want the hustle and bustle of the big resorts and all the touting and safety problems that go with them. The local beaches are unsuitable for children being rocky with pebbles, and the more suitable beaches are at El Medano (5 min drive north), or Los Cristianos (10/15 min drive south). Other attractions include ferry rides to Gomera Island, Jeep Safaris, Whale and Dolphin safaris and submarine and glass bottom catamarans. For the more active there is a Karting Club about 10 minutes drive away and at Playa Fanabe there is a 10-pin bowling alley. Onsite now there is a care facility for elderly or infirm residents. Tenerife is hot all year round. 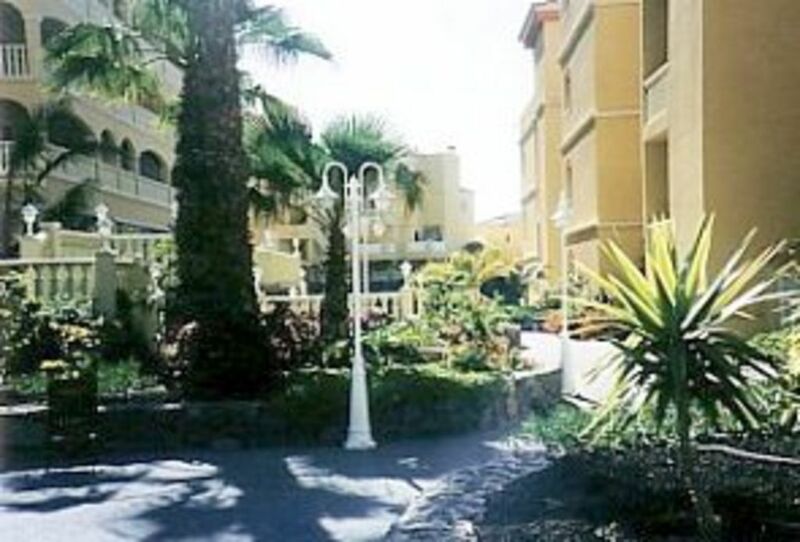 The Golf Del Sur is a lovely quite area with all the conveniences of a village. Winter Gardens is one of the nicest complexes there. We climbed every ladder on the building site before choosing. It has the best location. Heated outdoor swimming pool for Winter Gardens guests only. Towels for swimming pool use are not provided, please bring your own. Entrance to the garage parking is by remote control. Car Hire facilities are close by. Very good position but has some issues which have been referred to Owner. Loved the apartment, great balcony, sunny aspect and good view. Apartment a little tired, bed hard but very clean and everything you would need provided. The positives - the apartment is situated in a great area for access to shops and restaurants. The pool area is lovely and kept very clean. The negatives - the apartment is not adequately furnished/equipped - it is advertised to accommodate 8 - it may have beds for 8 but that’s about it! Although it doesn’t make any reference (or it didn’t when we went but I have since raised this so it might now have been amended) the only table provided for sitting and eating at - even though this is a self catering property - is a plastic table on the balcony which comfortably seats 4 - and 5 at a push! Not great if the weather is not nice - or if - as in our case - there are 7 of you! Also there were only 6 chairs on the balcony so even if the table had seated 7 only 5 of us could sit at any one time! Other disappointments were, as previously mentioned by someone else, only one set on keys provided - we were two families so really difficult as you require key to access pool area too (we subsequently requested another set and these were provided but no idea why not given initially! ), shower leaked in second bathroom, bedroom door jammed and had to get locksmith out to let us out of the room after being stuck in for 5+ hours from 5am (despite this issue with the door apparently already being a known issue with one of the management team it hadn't been addressed!) - it was not a pleasant experience on our first night!, bath towels old & threadbare, mattresses very uncomfy, one tea towel provided for 7 of us in a weeks stay (requested and got more), not sufficient cutlery (5 forks! ), crockery (eg 4 mugs of varying sizes and designs again for 7 of us! ), glasses, etc. Could have been lovely but let down hugely for us by these things - made the owner aware of these on our return and response was far from satisfactory although hopefully issues have now been addressed to make someone else’s stay more enjoyable! the towels were very flimsy and we had to go and buy 4 bath towels. only having 1 set of keys was a problem as we had work out were to leave the keys when went to different locations. two sets of keys would have been helpful. Also the lock on the apartment door was well worn and it took some time to get the key to engage. The beds were a bit lumpy. We only used the rooms for sleeping we ate out every day for b/fast and dinner but the kitchen did seem very well equipped. Amazing location. Well kept, spacious 3 bedroom apartment. The resort is a nice resort, we was very disappointed in the property. Unfortunately the property was not up to the standard that we expected for the value that we paid for the property. It was very worn and needed updating and decorating - we was advised to take our beach towels as bath towels where provided - the towels provided where old thin and discoloured. The property wasn't very clean on arrival and smelt. The property has no air con so we had to hire a air con unit. I had to buy glasses, utensils and tea towels as the owner / management agent hadn't supplied them for a self catering unit. I have a number of photos that I will supply to HomeAway.com in support of my review. The Golf Del Sur is situated on the south coast of the island, 15 minutes drive from the airport and close to the Golf Del Sur and Amarilla Golf courses. Winter Gardens is a new development featuring quality apartments. The main feature of the complex is a floodlit eight rink international standard bowling green. There is a lovely swimming pool and bar area, two restaurants and a golf and bowls shop. Golf: Golf Del Sur is The major golfing area in Tenerife and the 27 hole golf course, five minutes walk away from Winter Gardens, has been ranked highly on the PGA circuit in Europe. Also available at the golf club is a putting green, driving range and mini golf and pro shop. Trollies and buggies are available to rent. There are a further 18 holes at Amarilla Golf close by. The Standard rate above is based on 2 people sharing. The Christmas rate is based on 6 people sharing. Please add an extra £55 per person above that. Bookings for less than a week incur a cleaning charge of £100 Prices shown are based on a 1 week stay but if you'd like to stay an irregular number of nights please email for a price.